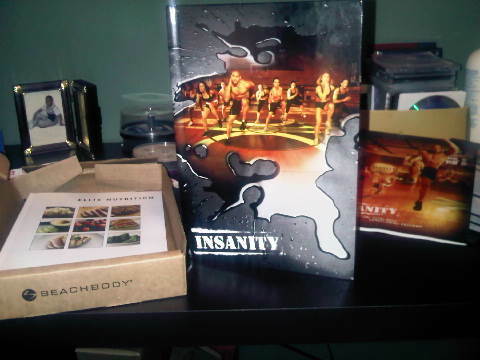 My High Intensity Interval Training Workout With Shaunt T and the Insanity Beach Body Workout Program Has Begun! I'm finally taking the plunge! I've been avoiding the Insanity workout program for months now. Because from what I understand Insanity is one of the hardest high intesity interval training workouts available. Insanity is a 60 day Max Interval Training workout that claims to get you in the best shape ever in 60 days. If you've read my other posts on interval training, you know that I think it's one of the best ways to lose weight fast and get a lean toned body without weights. Interval Training, as I've mentioned before involves moderate cardio-based exercises with short intense intervals. For example when I go to the track I walk to warm up; then run for 1 minute; then walk for 30 seconds. I repeat this for about 20 minutes. 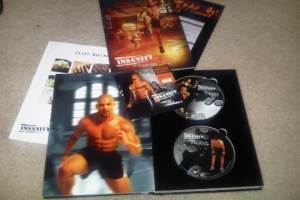 During a training call, Shaun T explained that the inspiration for the insanity workout program is based on his track and field days from the age of 16 -22 yrs old. He also said for a period of time he didn't workout and he gained some weight. And he lost that weight by dancing. Which is how he came up with Hip Hop Abs . So with Insanity, it's all about taking your workouts to the next level, improving your cardio, and getting your body in great shape using body resistance only. Which is something I definitely needed. Now after completing two rounds of P90X and most recently sticking a fork in my Body Gospel workout (one more day left), I'm ready for the MAX Interval Training challenge. There is no equipment needed for Insanity other than towel, water and a heart rate monitor - strongly suggested by the trainer, Shaun T. As I've posted before, I use the Timex T5G971 Unisex Sports Personal Heart Rate Monitor Watch. I wear my monitor during cardio workouts to track my heart rate and calories burned. It's a good investment if you can afford one. 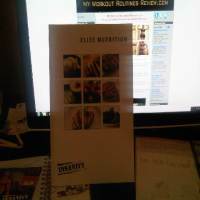 Also included in the Insanity package is an information brochure explaining the program and a note from Trainer Shaun T. You'll notice in the picture that the pull out calendar is a nice size. 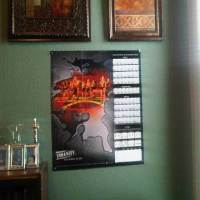 On the right side there is a 60 Day Calendar to guide you through which workouts to do and at the bottom there are blocks to track your fit test results. "The most important thing about Insanity, is fueling your body. -Shaun T"
The nutrition guide is a lot like the P90X nutrition guide, in my opinion. You're given recipes and suggestions for daily meals. There's also a step by step formula (The Harris Benedict Equation) to help you calculate your daily caloric needs during the program. According to the calculations, my daily caloric need during Insanity will be 1857.73 if my goal is to lose weight. If my goal is to maintain my caloric intake would be 2357 calories. In order to gain weight, I would add 250-300 calories. I figure as long as I eat clean like I did during my P90X program, I should be fine, but I will check back in with you on this later. Today is day 1 of my high intensity interval training journey. I took my fit test today and I must say I was huffing and puffing all over the place. The purpose of the fit test is to give you a starting point to help you see where you are and track your improvement over the course of the program. From the looks of the calendar I will be doing my next fit test on day 15 and subsequent ones on day 36, day 50, and day 63. So my 60 day Insanity journey begins and I will be posted as often as possible to let you know how I'm doing. I'm not sure that I will post daily. I tried that with Body Gospel but I don't think there is much value in daily posts if there is nothing new to share. I will try to post whenever I do a new DVD workout. If you have experience with this program or you are starting a workout for the New Year let me know that too. I'd love to keep up with your journey as well. Until the next post, see ya!